The LTE-enabled Samsung Galaxy Watch is now available from Verizon in 42mm and 46mm sizes. 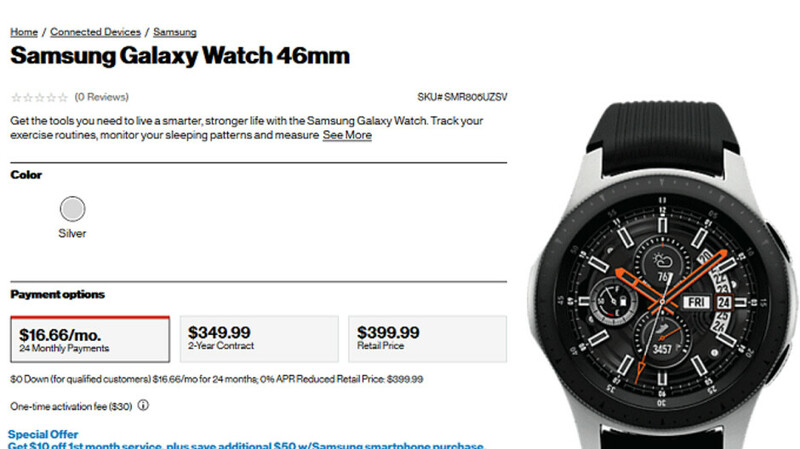 The 42mm model is $379.99 or $15.83 a month over 24 months. You can even pay $329.99 for the device, as long as you ink a two-year pact. The color options include Rose Gold and Black. The 46mm version will set you back $399.99, or you can make 24 monthly payments of $16.66. And if you want to sign a two-year contract for the sake of old times, the watch is priced at $349.99. The only color option at this size is Silver. The Galaxy Watch carries a 1.2-inch (42mm) or 1.3-inch (46mm) OLED display with a 360p resolution. An Exynos 9110 is under the hood, and the watch comes with 768MB of RAM and 4GB of native storage. The battery capacity depends on which model you have on your wrist. The 42mm variant sports a 270mAh battery, while the 46mm version uses a 472mAh battery to keep the lights on. Sammy's home-grown Tizen OS is pre-installed. The Samsung Galaxy Watch tracks your exercises, sleep, calorie intake and more. It reminds you to stay hydrated, and with the LTE model you can make calls, send texts, use Samsung Pay and stream music even without your smartphone nearby. The Samsung Galaxy Watch will also track your heart rate. Turn the bezel to see the latest sports scores or to view your playlists, and you can change the watch face whenever you feel like it. Purchase a Samsung phone at the same time as the Galaxy Watch and you'll get a $50 savings, and Verizon will also give you $10 off the first month of service. Went to Samsungs site randomly yesterday and seen it was finally with Verizon. Bought it the same day so far loving it! Are data plans for watches and tablets worth it? Tablets, yes. Watches, no. They’re selling you a standalone plan for a non-standalone device. Well most people but these on a carrier where the amwatchbsahes your data plan with another device. But let's just take an example of it being the only device on an account. It doesnt use much data. And you can be remotely connected to your phone at home. The most carriers only charge $10 for the line its on. This is a nice deal. At least on this one they are offering monthly 24 payments. On the Apple Watch and older Gear Se, its 6 payments only. This should encourage more sales. I wasn't gonna get one. But I also want an Apple watch. But now, I can get 2 watches one for me and the mate, for the price if one Apple watch and the 2 together costbthe same as whatbinoay for one phone. Perfect. Glad I came back to VZW. The LTE model is a standalone device. It can make/receive phone calls, send/receive texts, but does it actually use data? I’m not sure. Not worth it in my opinion, unless you don’t like to carry your phone sometimes.